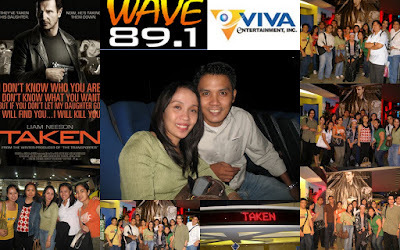 After getting home from watching the Movie Premiere of Taken, sponsored by Wave 89.1 and Viva Entertainment, I still felt shaken by the suspense and the dark reality of evil in the world, shown in the movie. It 's a good thing it ended on a happy note otherwise all the action would have been worthless. it would have been tragic. The movie, which stars Liam Neeson, I believe, was rightly given a PG 13 rating with the prostitution and violence but these were all necessary and central to the plot of the film. Some values communicated are patriotism, obedience to parents, honesty and sacrifice. After the movie, we took pictures with the other bloggers who watched the movie premiere. It was great to be reunited with blogger friends and to meet new ones as well. 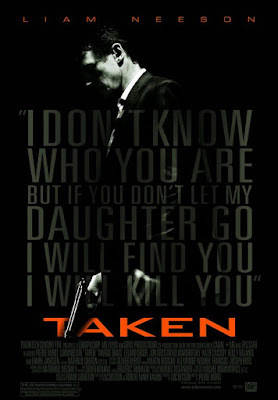 I love taken, i also did a post about it as well. its one of my favorite movie of all time now. I love the fact that its a story about the love between a father and daughter and what means a father would take to get his daughter back. I love it love it....I wish i had seen this movie sooner. Billy Graham on the Question "Where is Heaven?" How About Getting Into Paintball? Want A Pair of Havaianas? Looking for a Sea Coast Property?